Rare architectural gem in the heart of Queen West Art & Design District that backs onto Trinity Bellwoods Park. 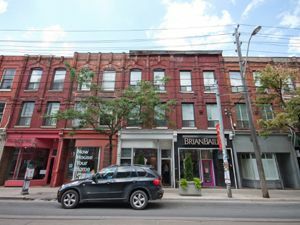 Approximately 2247 sq ft of renovated space occupying a main floor and mezzanine. Ground floor approximately 1470 square feet of open space with soaring 20' ceilings and 775 square feet of mezzanine. Convenient back alley loading, double door entrance, bathroom, kitchen, with butcher block counters, security and wifi as well as other amenities. Must be viewed, $45.00 square foot plus HST and TMI. Suitable for high-end gallery/office. Call Djanka at 416.930.0744 for an appointment. No agents. Availability Date: immediately.